By now many have heard about and understand the plight of the Monarch butterfly. Over the last few decades, their numbers have been steadily declining as they face food and habitat loss as well as pesticide exposure. Though they’re certainly a deserving and beloved species (plant milkweed! ), Monarchs aren’t the only insect or even butterfly that’s struggling. Here are five slightly lesser known butterflies found in the Mid-Atlantic and what you can plant this year to help them. The American Copper’s is a fairly common butterfly though anecdotally it is seen less frequently today than in the past. These butterflies are orange and grey with black spots. American Copper caterpillars preferred larval host plant (the plant where a butterfly lays eggs and is eaten by caterpillars) is Sheep Sorrel though it will use curly dock. Leaving sheep sorrel and curly dock available is important for their survival. 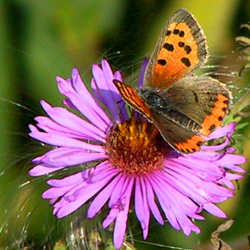 As adults American Copper butterflies will feed on a wide variety of available flowers. Commonly mistaken for other swallowtails this mostly black butterfly can be distinguished from other species by the black center on the orange spot on the inside corner of their hindwing. If you love the black swallowtail you may have to be willing to share a few of your crops. Black Swallowtail caterpillars will feed on carrots, dill, fennel, and parsley. As adults black swallowtails will feed on a variety of flowers. Like many other butterflies, they are particularly attracted to species such as milkweed, thistle, and clovers. 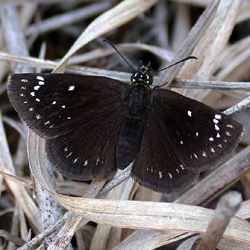 This butterfly can be identified by its glossy black (sometimes dark brown) appearance and the double rows of white dots prominent on the outer margins of the upper forewings. The Sootywing’s favorite host plants are lambsquarters, amaranth, and cockscomb (celosia). Adding some of these to your garden or in the case of lambs quarters simply letting them grow can help this butterfly thrive in your yard. 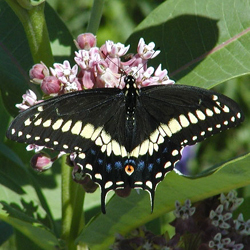 Adult Common Sootywings can be found feeding on dogbane, common milkweed, purple loosestrife, and wild indigo. 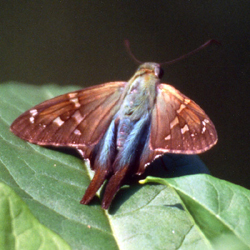 The Long-tailed Skipper gets its name from the long tails on its hindwings. It can also be identified by its iridescent blue-green head, thorax, and basal areas of both wings. This species of caterpillars feed on legumes, including cultivated varieties. Legumes include all sorts of beans and peas, alfalfa, clovers, and wisteria. Many of these species also happen to be really easy to grow. In their butterfly stage, they will feed on a variety of flowers. 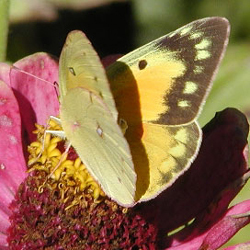 The Orange Sulfur can be identified by yellow-orange to darker orange upper wing surfaces. Like the Long-tailed Skipper, Orange Sulfur Caterpillars feed on legumes. However, Orange Sulfurs have a strong preference for alfalfa earning them their nickname the alfalfa butterfly. As adults, they aren’t selective about which type of flowers they feed on. The most important consideration with flowers is providing blooms throughout the season. Plant successions and choose flowers with a variety of bloom times from early to late. Choosing native plant varieties can also help butterflies succeed. Check out our Welcome-to-the-Garden Pollinator Collection. Avoid the use of pesticides whenever possible. Even certified organic pesticides can affect more than the targeted species. Especially if you live in a dry area consider adding a water feature for butterflies and other pollinators to drink from. These are just a small fraction of the Mid-Atlantic’s native butterflies. If you’d like to help butterflies and other pollinators consider some of these tips as your planning and working in your garden this season. Recent studies have pointed out just how important our digestive health is. Did you know that your digestion can affect not just your physical health but your mental health as well? The gut influences the amount of serotonin (a hormone that regulates feelings of happiness) the body produces. While there are many components to a healthy digestive system, the following herbs all have a history of being used to support digestive health. Consider adding a couple to your garden and diet this year. 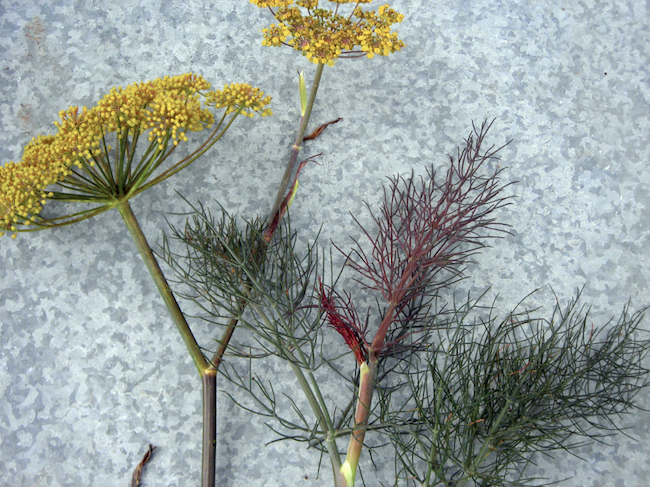 Native to the Mediterranean, fennel has been used as a carminative (to treat flatulence and related discomfort) for centuries. Medicinally, it’s typically consumed in tea and was sometimes used in “gripe water” once commonly used for infants. While today many think of chamomile tea as being good for relaxation it’s also excellent for digestion. It has anti-inflammatory and anti-spasmodic properties which can help soothe upset stomachs and reduce gas. For most, sage is now thought of as solely a culinary herb but it has long been used as a digestive tonic. It’s astringent and antibacterial and is believed to help treat diarrhea and calm gastritis. A tasty tea made with anise hyssop can be enjoyed with a meal to help promote digestion and reduce gas and bloating. It’s great for bees too! Drinking mint tea is a tasty way to aid your digestion and reduce nausea. In some studies taking peppermint oil has been shown to decrease symptoms related to IBS. Odds are this one is probably already growing in your garden. It may seem like a nuisance but dandelion is a very tasty and helpful plant! Full of nutrients, all parts of the dandelion are edible and some studies have shown consuming dandelion to help with digestion and reduce constipation. It has been used for centuries in Southeast Asia as a culinary and medicinal herb. Ginger is excellent for treating nausea, heartburn, and morning sickness. It can be made into tea or candied for on-the-go relief. Though research into goldenseal is ongoing it has a long history of being used to treat gastrointestinal issues and is believed to have anti-inflammatory, anti-diarrheal, antibacterial properties. Largely due to overharvesting this North American native is endangered. Planting goldenseal in your woodland can help ensure its survival. Its anti-inflammatory properties have lent turmeric to a number of medicinal uses including treating arthritis but it is also excellent at supporting digestive health. Turmeric is traditionally used in a number of Indian dishes. It’s what gives curry that bright yellow color! You can also make it into tea or golden milk for a warm, relaxing drink. 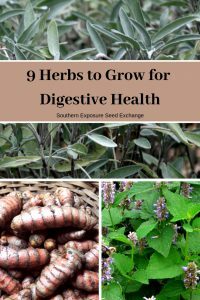 If you often struggle with digestive issues or are simply interested in herbalism you may want to make room in your garden for a couple of these wonderful plants. Another great way to support your digestive health is by eating plenty of probiotics. Pick up some cabbage seeds and check out our easy instructions for fermenting your own sauerkraut. ***We’re not doctors, always check with your physician before attempting to diagnose or treat any condition. When compared to the history of agricultural being able to order seeds each year is a relatively new thing. For thousands of years, seed saving was simply a part of gardening. This family tradition created the heirlooms we know today and adapted varieties to specific local conditions. Whenever we save seeds we’re making decisions about what future generations of plants will look like. Saving seed for next year takes careful consideration. Especially with easy to save species like potatoes or garlic it can be tempting to plant whatever is leftover or whatever you don’t want to cook with but it’s important to remember this will affect future harvests. Take a look at some of the traits you should consider when saving seed. This is a plant’s ability to germinate well and quickly grow into a healthy, productive plant. Even if you have a relatively long season, selecting for early production may be desirable. Plants that mature quickly can allow you to enjoy produce earlier in the year, avoid the intense heat of late summer, avoid certain pests, or allow you to harvest multiple crops. 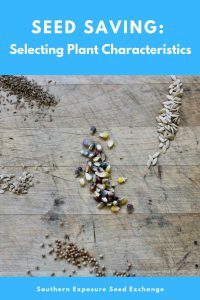 If you’re trying to help preserve an heirloom variety you want to be sure to save only save seeds from plants that are true to type, displaying the characteristics unique to that variety. Saving seed from year to year can adapt a variety to better withstand your local pests and diseases. This trait is another way you can adapt a variety to your specific garden location. Tall, spindly plants can be prone to lodging and other problems and often need additional trellising. Stocky plants are often healthy plants. Note, this trait can also be affected by nutrient availability and how closely you space your plants. Particularly for crops grown in early spring or late fall you want to select for plants that withstand cold temperatures. Avoid saving seed from the first plants that go to seed. Selecting for those that bolt later will increase your harvest period. It may not seem as important as disease resistance or flavor but often times their unique color is why people fall in love with an heirloom variety. 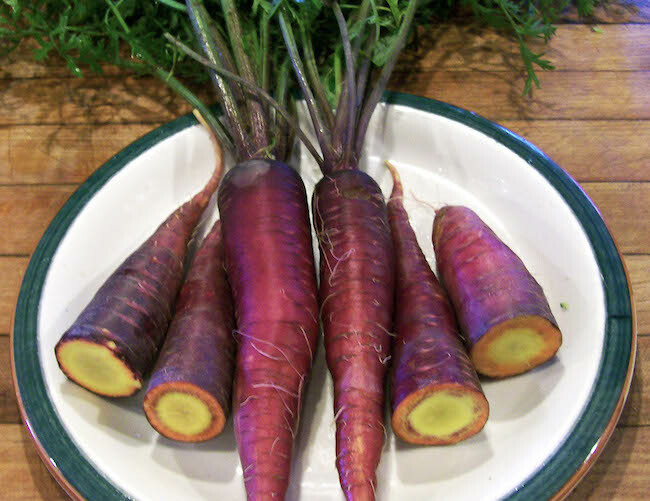 Selecting for the most intense Purple Dragon Carrots is part of what makes the variety special. This trait will depend upon your variety. You may want all of your green arrow pea plants to be a uniform height but obviously, you don’t want your rainbow swiss chard to have a uniform color. One of the best things about heirlooms is their amazing flavor! Always take this into consideration in your seed saving endeavors. Life is too short for tasteless vegetables. This trait will largely depend on a variety’s purpose. Tomatoes like Principe Borghese which were bred for drying should have much less moisture than slicers like Radiator Charlie’s Mortgage Lifter. If you love stuffed jalapenos save seed from the biggest peppers. This is another great way to make a variety work for you. Don’t eat your biggest, best cabbages even though it’s tempting. Let those go to seed so that in a few years more of your cabbages will resemble the best. Although it may seem less important in modern times when everyone has a fridge and freezer, storage ability should still be considered particularly in plants like storage tomatoes, pumpkins, winter squash, sweet potatoes, etc. 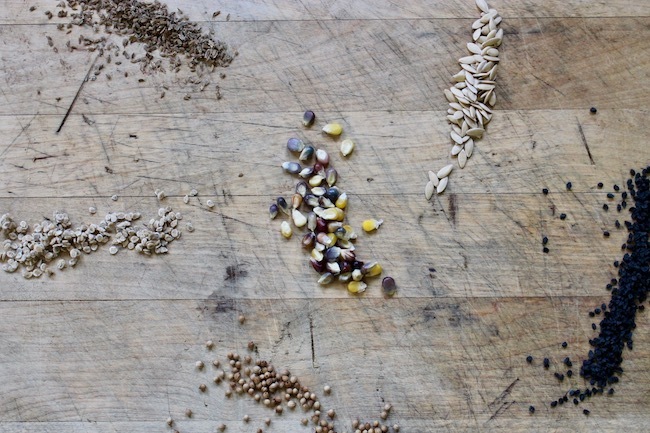 There are so many qualities to consider when selecting seeds it can be tough to keep track. One thing you can do to mark a specific plant is to loosely tie a bright colored piece of yarn around it. This will allow you to remember which plants displayed traits like vigor when it’s time to harvest seed. Be sure to keep an eye on the yarn as the plant grows so it doesn’t get too tight and harm the plant. Alternatively, you can place small stakes in front of plants to mark them.